It appears that Math Type will no longer work with Microsoft Word due to the recent upgrade to 64 bit processors on the teacher and student laptops. However, there is an awesome add-on that can be installed for free from the Chrome web store called g(Math). It is essentially math type for Google Docs. g(Math) allows teachers and students to create graphs (including plotting points) and write complex math directly in a Google Doc! Some examples include Geometric signs, custom characters, and formulas (like the Quadratic formula). With the graph creator, you can type in functions and it will create the graph associated with those functions. You can also plot points in the same graph, find the line of best fit of those points, and specify a viewing window. This will be an invaluable tool for any math class or math teacher. The best part of g(Math) would be the fact that students now have the option to work collaboratively on a document. 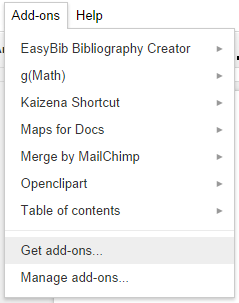 To install this awesome add - on in Google Docs, simply open a Google Doc and Click --> Add-ons --> Get Add-ons and do a search for gmath. Once g(math) is installed it will run in the docs sidebar when you enable it from the drop down add-ons menu.